Africa and aid are two words that seem to go side by side. According to worldatlas.com, of the top 20 countries receiving foreign aid around the globe in 2016, 10 were African. The Organization for Economic Co-operation and Development’s (OECD) 2014 report shows that Africa received US $36 billion in foreign aid in 2013, the largest to any continent in the world. It would be expected that with the billions being invested in the continent, hunger, malnutrition and many other sundry under-development issues will be greatly reduced. Sadly, the continent continues to rely on first- and second-world countries to save her from herself. Debt levels across the continent are on a steady rise culminating in the need for an introspective look for true development, particularly as the US is now cutting down on aid to Africa. A majority of scholars are of the opinion that development aid is troublesome and indeed, this cannot be completely faulted. Of a truth, development aid has fostered in Africa and its leaders a spirit of dependency. Rather than using these donations as aid for development, many African countries have converted it to an enabler of complacency—a situation where they know that aid will come, and therefore they do not have to work at engineering economic prosperity of their own. In July 2016, the International Monetary Fund (IMF) granted a loan of $304.7 million to Madagascar. Also, in December 2016, the country secured $6.4 billion commitments at the Paris Conference to finance its national development plan. Yet, Madagascar remains one of the poorest countries in the world, with chronic levels of malnutrition and low levels of education. In November last year, the United Nation Food and Agriculture Organization (FAO) gave Mauritania $39 million to help with the country’s food security needs over the next few years. 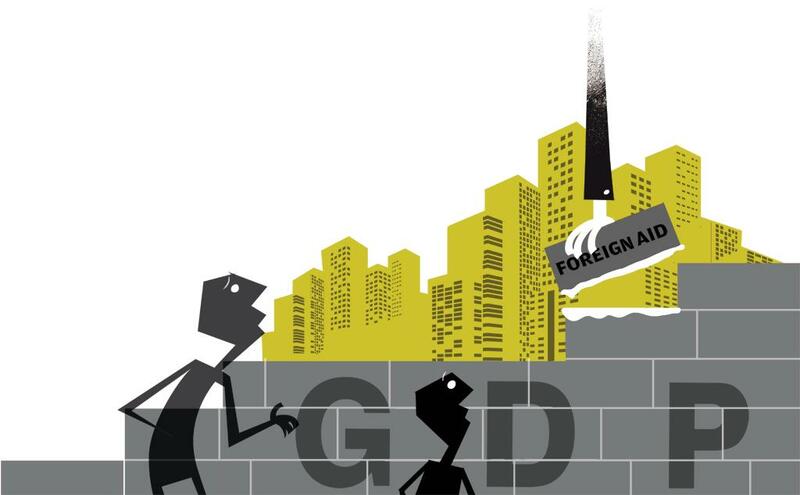 The African Development bank (AfDB) and other financiers are also lending $102.5 million to the country, but this spate of borrowing has taken the country’s debt level to dangerous heights, with public debt due to hit 80.8 per cent of Gross Domestic Product (GDP) in 2018. Like Mauritania, Djibouti’s debt levels have been skyrocketing since 2014, with the government sourcing Chinese loans to build rail line and other projects. The country’s debt now stands at more than 85 per cent of GDP and is predicted to stay that course until 2021. In Guinea, although the Chinese government has promised investment of $20 billion over the next 20 years, it is strictly in exchange for access to some of that country’s bauxite reserves. In reality, Africa has resources, both human and material to help foster development such that the continent will not be aid dependent. Be that as it may, it would appear that the stance of the Donald Trump administration in the US may be the catalyst needed to force African leaders to rethink their policies and re-pattern priorities in a way that domesticates the development ethos. Members of the African Union will have to face the reality that they cannot continue to rely on the West, or anyone else for that matter, to be the fulcrum of their development. For a fact, aid in itself is not bad. It is often the structure and application of aid that falls short of the ideal. This has led more persons to call for trade rather than aid to Africa as a surer route to a more developed economy. For example, the recent move to develop a single African Air Transport Market is a clear step in the right direction, as reports show that 80 per cent of air travel from Africa to the world is controlled by Non-African airlines. This move, projected to create 300,000 direct and two million indirect jobs, may be the best indicator yet, of a changing paradigm. Going forward, African countries must come up with a viable strategy to address the continent’s employment time-bomb. Without doubt, the projected shortfall of 72 million jobs by 2020 is a recipe for disaster. No sector is better positioned to churn out these jobs than agriculture as 65-70 per cent of Africans rely on it to make a living. Accordingly, Africa must begin to think in terms of setting up regional infrastructure for processing and development of the agriculture value chain. In doing this, the need for activities in the sector to break away from the stereotype of rural development to a narrative of business cannot be overemphasised. Since assuming leadership of the bank, Adesina has been charting a beneficial course for African farmers through a “Feed Africa” strategy aiming to provide access to finance, technology, mechanisation, market and infrastructure to transform the agriculture sector. As sovereign entities, African countries must position themselves to take advantage of developmental efforts especially in the form of trade and commercial activities, not only from within the continent but from a global perspective. Examples of front liners such as Rwanda should be followed. The country recently launched visa-free travel into their country and has made registering a company so easy that it can happen within hours. These are concrete economy boosting steps that show a country is ready to use foreign aid for trade. While it will not be in anyone’s interest to cut off foreign aid to Africa, it is clear that countries that receive such aid must show more responsibility. They must ensure that help trickles to those that need them. Instead of seeing such aid as handouts to be used in the short term, African leaders should be more forward-looking. Given the recent challenges encountered by Europe through the migrant crises, it is clear that Africa’s development is a global imperative. Therefore, aid to Africa needs to be structured and delivered in a way that makes it a stimulant for increased productivity and economic empowerment. (This column was first published with the cover story in the 16-28 February issue of Down To Earth, under the headline 'Aid the trade').